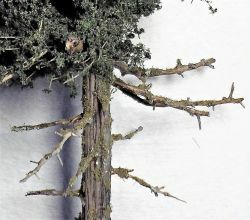 A hand made premium Fir Tree 180mm (7") + tall with old-growth, new green foliage and our highly detailed cedar trunks. Includes dead branches, moss covering, and planting pins for direct-to-layout application. Pictures are taken using 1:35 scale models.